Your best resource for navigating the college-selection and application process is your student's guidance counselor. 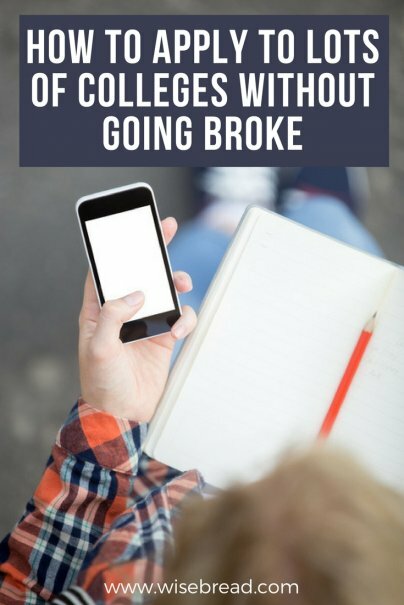 College admissions is a huge part of their job, and they have plenty of tips and tricks on how to get through it in a cost-efficient manner. College applications are more affordable when you plan early. "Good planning leads to good decisions, says Patel. "Most counselors and professionals recommend that students apply to five to eight colleges, so this means these five to eight colleges should be chosen early. Late discoveries lead to errors in the application and an eventual spreadsheet approach that forces students to apply to 15 colleges they're not sure of." This'll make your wallet happy: There are no-fee colleges and universities out there (good ones, too), and you can find the best of the best on this ranking of the 2018 Best Colleges with No Application Fee in America. That doesn't mean you should whittle down your choices to only these schools, however. Talk with your student about his or her goals and what they want from the college experience, and also be realistic about the schools by which your child has a chance of being accepted. If some of the no-fee colleges fit onto that list, great. If not, put them out of your mind and move on. Having your child choose a college they don't necessarily want to go to will cost you much more than that waived application fee if they want to transfer a year later. Fee waivers are available for low-income families. For instance, students who qualify for free or reduced lunch can have their application fees waived at most colleges. Some students also can take the SAT or SAT Subject Tests using a test-fee waiver that will let them apply to more than 2,000 colleges for free.